MCC Cabinets, believed to be the leader in modular and custom cabinetry, is offering a free solid surface or stainless steel undermount sink, and a Tapmaster hands-free foot control, to those who purchase an MCC Sterilization Center with solid surface countertops by December 31, 2006. 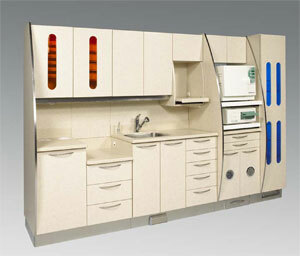 An automatic slide-out hands-free clean pantry with fan for easy access to sterilized materials. It also has a slide-out waste module that includes a countertop sharps drop and biohazard waste drop. The solid surface countertop, slide-out handpiece cleaning equipment shelf, and slide-out sterilizer shelves make it easy to maintain asepsis, claims the company. It has extensive storage space, including an upper tub and tray storage module and bulk storage module. Conveniently located cassette wrap shelf and wrap drawers that maximize efficiency. Red and blue indicator lights that signal sterilization progress. The MCC Sterilization Center is available in a variety of sizes, colors, and configurations. The stainless steel base comes standard. According to the company, the product is covered by a one-year manufacturer's warranty and is available through most major dental product dealers.